Thank you to all the players who made the effort to enter the Herts Closed, at Radlett this year. Again entries were very low unfortunately, but those who did enter were involved in a great weekend of squash and have undertaken to spread the word further next year and encourage other players to get involved and support the county. Thank you to our sponsor John Apthorp the President of Radlett Squash Club, who came down to watch the finals and present the prizes. It was great to hold the tournament at Radlett again this year, thanks to them for their hospitality and for hosting the event for us. There were some epic matches in all categories of the competition. All the finals were closely fought. In the Men’s B Final, last year’s winner Dan Ludlam just beat Paul Cousins in a nail biting five setter. Ali Coker came from two games down to beat Simon Evans in the Mens O35. In the Men’s Plate Owen Ledger also came from two games down to beat Adam Clarke. The Ladies O40 final was between sisters Maureen Morrison and Sheila Blake with Sheila just losing in the fifth. 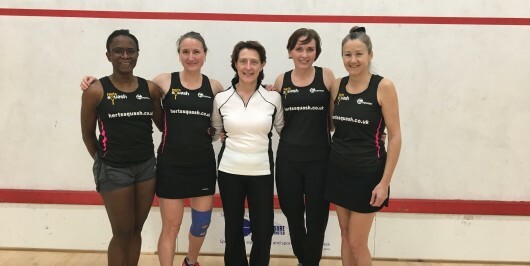 Sheila was also in the main Ladies Final against new face Cathryn Abernethy and after a hard fought match Sheila unfortunately just lost out again in the fifth game. The Men’s A Final was a fantastic culmination to a weekend of squash. Congratulations to all the winners and runners up. The finals were videoed again this year and these will be downloaded later in the week, so watch this space.